For Irish Dance readers, you don’t need much explanation, but since I expect others to see this, a little back story. My daughter (TGC – the girl child) is a competitive Irish dancer. We booked this hotel so we could go to Oireachtas (pronounced o-rock-tas), a regional championship for Irish Dance. The Mid America Oireachtas is always Thanksgiving weekend. There are several others in November and December. 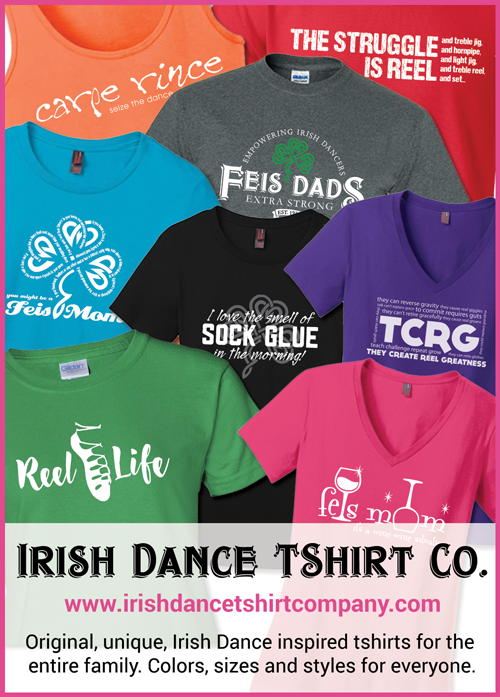 An Oireachtas will have several thousand dancers with all the parents, siblings, etc.. that come along with it. You may have gathered already that I blog as What The Feis (pronounced fesh). A feis is a smaller more local competition. I am also whatthefeis on Facebook, and several other social media outlets. The What The Feis Facebook page as over 5000 followers. 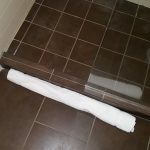 The hotel staff DID NOT know this beforehand. 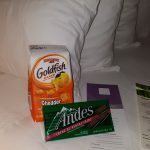 I originally documented this on my Facebook page, but the hotel posts are mixed in with a lot of Oireachtas posts, foodie posts, things about my dancer, and my typical snarky ramblings, so I gathered all of them here, for easier, albeit a bit lengthy, reading. All the indented, italicized items are the posts from the page. For my Facebook friends, you know TGC is dealing with a medical issue that may end her competitive career, we are still checking into all that since that news is recent. I only mention that because we went into this weekend thinking this could very well be her last competition. It really made the staffs efforts even more special, to me anyway. 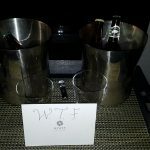 I kept the hotel a secret until the writing of this post. I didn’t want any dance drama when other parents found what they were missing out on, and could very well be in the same hotel as me. So, here is what happened… sorry again for the length, but in this day and age, this kind of caring is hard to find, especially when it comes from people who do something nice because they want to, not because they have to. NOTE: You can click on any smaller pic to scroll through all of them in a bigger view. My introductory post about an email I received from the hotel. Getting ready to travel for this Oireachtas, I just have to share an email I received from the hotel where we will be staying. I will finish this story (and share the hotel) at the end of the weekend, but I wanted to set the stage now. Actually we always request non-feather pillows. A roll away would be appreciated (please confirm this one). Lastly, we are there for the Irish Dance Regional Championships, so an upper floor at the end of the hall where my dancer can get some rest would be great if at all possible. PLEASE NOTE: Mrs WTF and TGC do not expect those things, but they asked, so I included them in the email. Also noteworthy, this is one of the hotels in the block, not the Ritz. Yes, that is my actual email. I received a response today saying he is working on it. 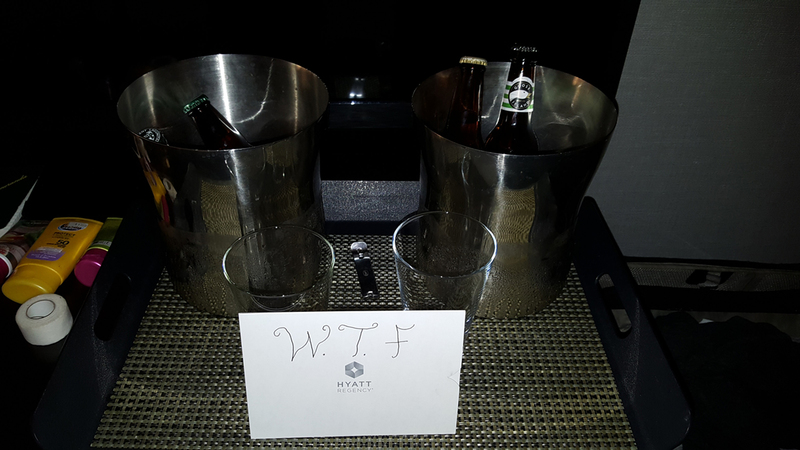 Just got to the hotel, into our room and found this. If you have been following my posts, you get it. An exceptional welcome after a very long drive and OUTSTANDING CUSTOMER SERVICE! I failed to mention in my posts that the rep sent me an email in the interim. He had noticed we had a room with two doubles where a rollaway would not fit. He asked if we would like king with a rollaway instead. I jumped at the chance. That is what we usually get, but it was not available we we made the reservation. Also, not only did he get us a quiet room, it was top floor, end of the hall. Irish Dance Hotel Nirvana. I took the luggage cart down to the lobby as TGC and Mrs WTF freshened up. As I was getting on the elevator, hotel staff walked by with a tray with a bottle of champagne. I thought, nah, couldn’t be.. I went back to the room to find this. Trying to show our gratitude. I went to the front desk to find who delivered the tray since the Mrs had no cash, and I wanted to make sure the person got a tip. The nice lady at the desk said it was all from the front desk staff, they had all seen my email, it made them laugh, and they wanted to make it happen, and that tipping wasn’t necessary. I know it sounds braggy, and I am sorry, but this story just keeps getting better. Got back from dinner, and realized we were going to save the bottle for tomorrow, so I went to find more ice. I got to the elevators, and saw an older gentleman mopping the floor. I stopped to ask about ice, he saw the ice bucket and bottle, and said, ‘oh, you are here’ with a smile on his face. 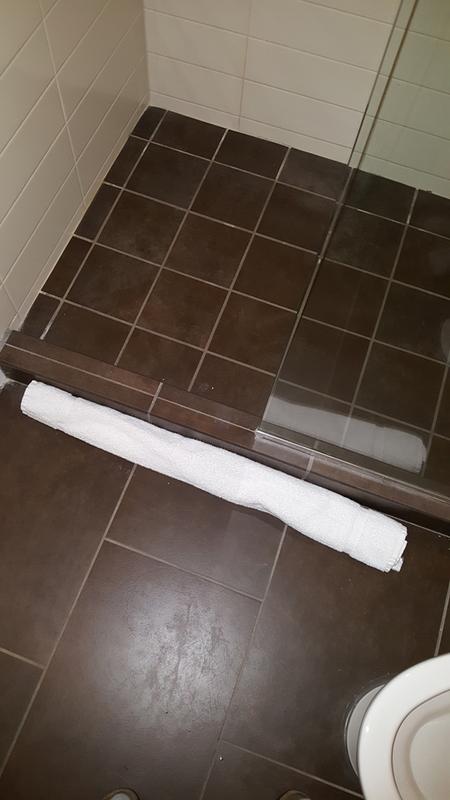 I must have looked confused, because he followed up with the fact that he was the one who brought the rollaway to the room. I got his name, thanked him repeatedly, and found the ice. Don’t worry, I already have a plan in place to thank these wonderful people, in addition to reviews I mean, but I also realize I need to do a little more research to make sure I am thanking all of them appropriately. 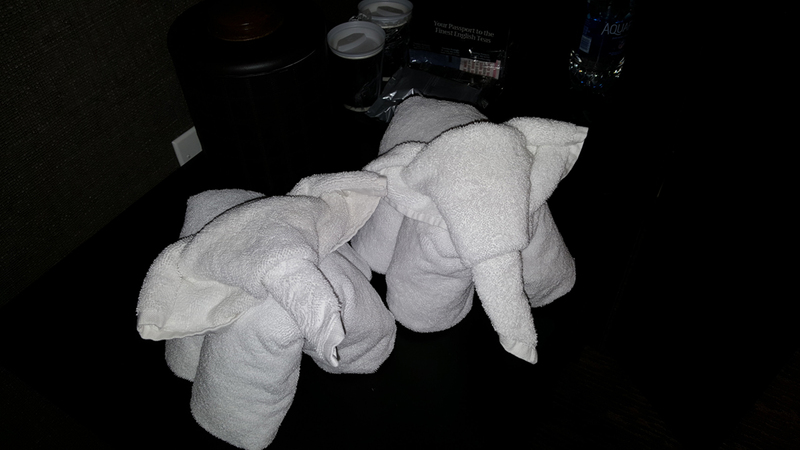 And this morning, I found the towels shaped into animals. The bath mat is a snake. OK, so maybe that was a stretch, but they literally did everything else in my email. Since we were up early to get TGC tanned, and then got brunch, the room had not been cleaned by the time we got back. Contrary to what you might think, we are really not high maintenance, so we put up the do not disturb sign so TGC could rest. She is still trying to beat that respiratory infection. I kind of laughed, and asked if she was serious, she said yes. Of course I said yes, and two minutes later she was at the door with what is in the pic. I thanked her repeatedly. She smiled as she left and said, maybe there will be more animals tomorrow. I really don’t know if I will ever be able to stay with a different chain in the future. For those of you that were wondering, and I was wondering, I am fairly sure that this WTF gig had nothing to do with my welcome at the hotel. As I sat polishing tonight, another family I know IRL checked in and we chatted. They got the same email, and the only connection we can see is that we are both members of the hotel rewards program. 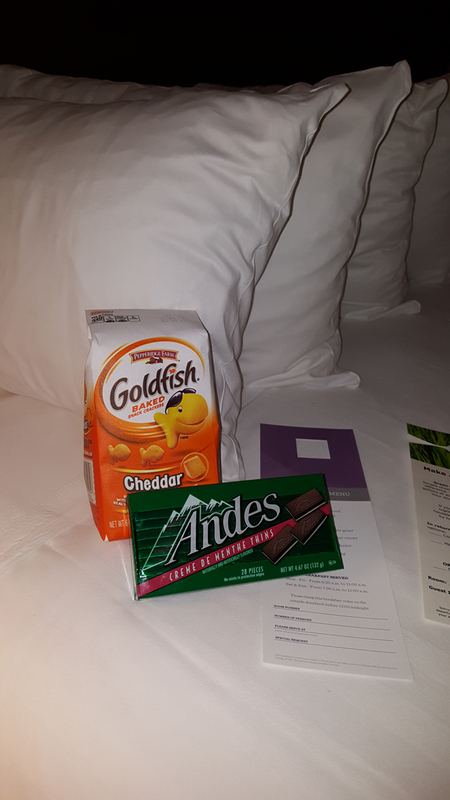 HOTEL UPDATE… Well, returning to the hotel after 15 hours at the venue, I am both sad to report, and yet a little relieved, that the surprises appear to have come to an end. They literally got everything on my list, plus a few extra things, so I don’t know what I was expecting, but I wasn’t expecting everything that happened either. Tomorrow I will hopefully meet the Mastermind. I will let you know how that goes. I have a little something for him and his co-conspirators. The ‘extra things’ I mentioned are in the pic but were not in our email (the snarky part of the email). They included chocolate covered strawberries, 3 cookies the size of softballs, and two ice cold glasses of milk. So earlier today, I met the people who lead the challenge sent in the email, although I still stand by the fact it was sarcasm. Anyway, I had bought a card and some gift cards for some drinks and appetizers for hopefully all the people involved, and gave it to the guys, with my sincerest thanks, and a little lump in my throat considering what a rollercoaster the last few days have been. Their thoughtfulness has made this Oireachtas memorable for so many reasons more than Irish Dance. 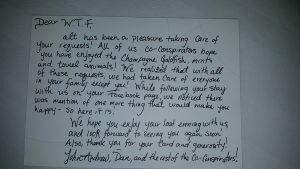 I also told them about you guys, how I have documented every new chapter in this story, how so many people have commented on the story, how you want to know what hotel it is, and why I am stalling sharing the hotel, etc… and I gave them my business card, and told them where they could see the posts. I said thanks again, and I thought that was that. Well, went to the venue for ceilis and trad sets, saw our dancers do great, including a first in one of the trad comps, sat through just enough awards to see how our ceilis did, and then went to dinner. 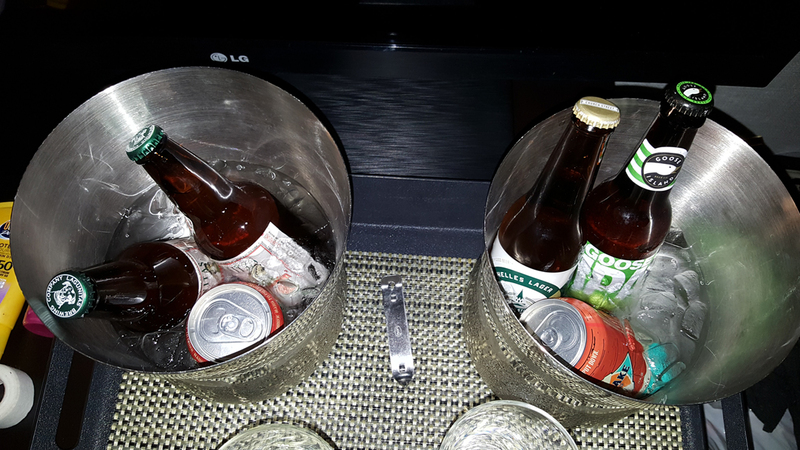 On the way back into the hotel, TGC wanted dessert and I wanted a beer, so we went to the bar to take some stuff to the room. As we left the bar, I saw John, the initial emailer whom I had met earlier, and he asked me why I was carrying a beer, and if I had been to the room yet. I said no, and he said ‘you might want to go on up. 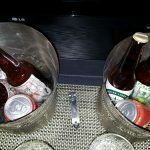 I read the posts and realized we took care of everyone elses request, and I saw a post that that gave me an idea.’ or something like that. I was kind of in the ‘oh no he didn’t’ mindset. I smiled, shook his hand, told him again what a great job his team had done, and headed for the elevator. As I was going to the elevators, I got a text from Mrs. WTF that said, ‘seriously, come up here.’ I hadn’t even made it to the room when she called my cell. I didn’t answer, I was 12 feet from the room. I walked in and found what is in the pics, including the note, also in the pics. Second time this weekend I was without words. I really cannot think of ANY time in my life when people who do not even know me put this much effort in on my behalf. I rewrote this paragraph a few times, because the words have not been quite right. They still aren’t, but I think you get the picture. So, hotel to be named Monday, Thank You again. You have done more for the reputation of your company then any effort I have seen by any other person/group/company. 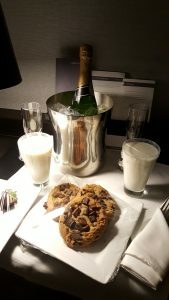 I look forward to the next opportunity to stay with your chain, especially if it is anywhere near Schaumburg, because I know where I will be staying. 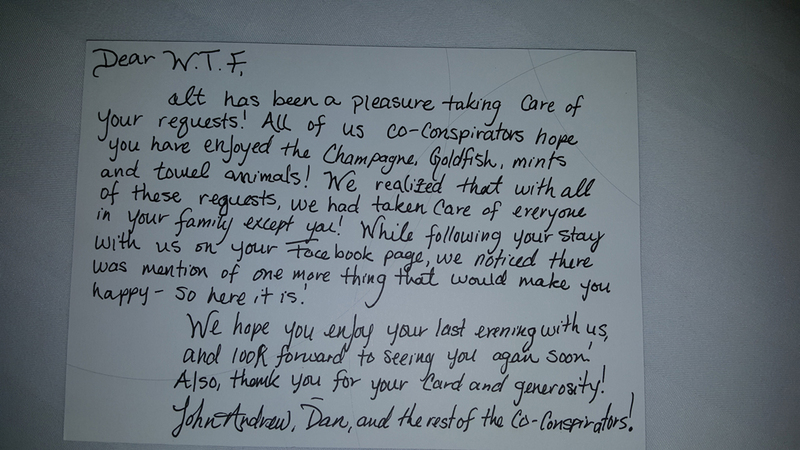 Oh, and I made the card out to John and the Co-conspirators, and they had no idea I had a FB page with 5K followers. John was doing his job, I was being me, and it just grew from there. Not really sure how to end this, except for saying I hope every one of you get a chance to experience this kind of service one day. It meant so much to my family, and Hyatt will be our first choice for all our future hotel choices. * Mistaken Identity Footnote: I think the hotel thought I was the Commander of 7th Fleet (a Vice Admiral), instead of a Commander who worked with 7th Fleet, but that is speculation. I was following this on Facebook over the weekend, and I just am so grateful that you were willing to share the entire experience. I’ve never worked in hospitality, but in every position I’ve had over my career have been customer service/client facing and can tell you, your gratitude means a lot. It sounds like the staff really had fun (knowing you weren’t being demanding) and that goes a long way. I’m sorry TCG didn’t have the Oireachtas she hoped for, I know how that goes too. I’m thinking about her and hope she has a strong recovery (and that this isn’t the end of the road for competition for her.) Take care!